Hotel, Product Manufacturer Settle Insurance Claims From Man Who Suffered Severe Hand Injuries From Shattered Coffee Carafe Our Virginia personal injury law firm helped a college student obtain insurance settlements from a the maker of a defective glass coffee carafe and from the hotel that failed to protect him from the dangerous product. Carpenter Disabled by Design Defect in Custom-Built Ski Boat Receives Confidential Settlement Our Virginia personal injury law firm helped a contractor secure a fair settlement from the company that improperly designed his custom-built ski boat, allowing him to suffer permanent nerve damage from a trapped foot and ankle. Defective Stepladder’s Failure Leads to $375,000 Settlement Our electrician client broke his lower leg in multiple places and suffered a permanent disability after a negligently designed ladder that its owner had a legal duty to inspect and replace collapsed as he stood on it. Mr. Shapiro and his co-counsel discovered the reason this tragedy occurred and sent a strong financial message to the manufacturer about how important it is to make safe products. Steve B. The law firm took care of everything. They were so polite and kept me informed throughout the process. Roy B. Working with the U.S Consumer Product Safety Commission, John Deere has issued a recall of more than 15,000 lawn tractors equipped with a defective mower blade breaking mechanism. According to the CPSC, failure of hardware used to mount the brake under the mower deck "can cause the mower blades to spin longer than normal after the operator turns off the power, posing a laceration hazard." Affected tractors have model numbers starting with D100, D110, D120 and D130 and were sold by Lowe's, Home Depot and licensed John Deere dealers across the United States. 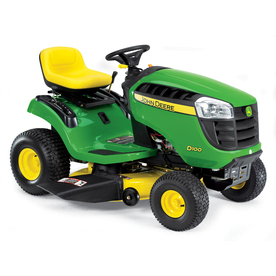 Each of the recalled tractor has a 42-inch Edge Cutting System mower deck.. In addition to standard recall language advising consumers to stop using the lawn tractors and to contact John Deere for refund or replacement details, CPSC took the additional step of reminding retailers and individuals that "it is illegal to resell or attempt to resell a recalled consumer product." Neither federal officials nor Deere representatives have received any reports of injuries caused by the defective blade brake, but the risks for cuts, lacerations and even amputations from mower blades cannot be overstated. Citing a CPSC report, Science News Daily noted that "nearly 210,000 people -- approximately 16,200 of them children under age 19 -- were treated in doctors' offices, clinics and emergency rooms for lawn mower-related injuries in 2007." As a Virginia (VA) personal injury attorney, I am glad that Deere acted to get its dangerous products out of people's garages and off lawns before the tractors added to the statistics of lawn mower injuries. I recently reported on a delayed recall of Black & Decker line trimmers that did result in several people becoming hurt by machines they never should have had access to in the first place. Any time a lawn machine poses risks to users' life and limb, companies and regulators must act promptly to protect consumers by issuing a recall.